In February of 2017, the Pacific Institute released a white paper entitled Drinking Fountains and Public Health: Improving National Infrastructure to Rebuild Trust and Ensure Access, which highlighted the limited evidence of a link between illness and disease outbreaks and drinking fountains. The report found that most problems could be traced to contamination from poor cleaning and maintenance or old water infrastructure in buildings, and called for comprehensive testing of drinking fountains, implementation of standard protocols for fountain maintenance, and a nationwide effort to replace old water infrastructure, which can be the source of lead and other contaminants. One aspect of efforts to expand access to fountains is to take a look at current drinking fountain technology and identify features that can help ensure their quality, convenience, and reliability. Ultimately, these features can help increase public confidence and access to high quality and affordable tap water. A gallon of tap water from typical municipal water systems costs about half a cent, making drinking fountains the cheapest hydration source available in public spaces (and of course, almost all public fountains are completely free to the user). This cost may increase somewhat depending on the purchase, installation, and maintenance costs for each drinking fountain, but it remains far cheaper than the cost of bottled water, which typically ranges from $1 to $5 per gallon, or about 200 to 1,000 times more than tap water. (High-end bottled waters can be even far more costly.) These costs do not include the environmental costs of the bottled water industry. With many useful features that increase water quality and convenience, drinking fountains need no longer be the forgotten relics of the past. Cities, park districts, schools, hospitals, and other entities managing public spaces can offer fountains with many available options, including vandal resistance, freeze resistance, refrigeration, bottle filling, and filtration. Josselyn Ivanov provides a useful infographic of drinking fountain typologies, some of which are described below. 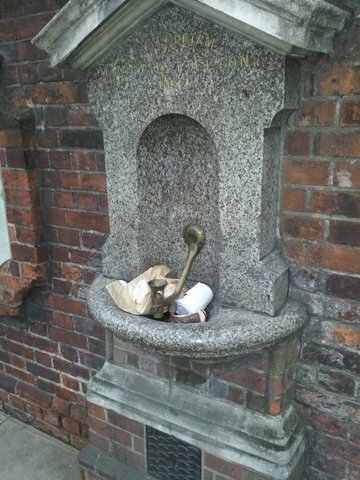 PHOTO: PETER GLEICK, LONDON, UK –Many public drinking water fountains suffer from lack of regular cleaning and maintenance. Other fountain features can be added to cater to users’ needs. Fountain bubblers (or spouts) vary from the very basic, such as a spigot, to the much more advanced. The most common is the arc bubbler, which is equipped with a mouth guard to prevent direct contact. Halsey Taylor fountains have a “Double Bubbler,” two converging streams that provide a fuller flow and extend the distance between the spout and the user. Most Dependable Fountains (MDF) can be installed with a “Safe Stream Bubbler” that self-seals by dropping down and locking into position when not in use in order to prevent potential contamination. Additionally, some designs include an additional spout that serves as a pet fountain or a station for washing hands and feet. The most notable improvement in drinking fountains in recent years has been the bottle filling option. The demand for bottle filling stations or bottle filler attachments increased significantly between 2010 and 2015 due to the proliferation of refillable bottles, the ease of use of these stations, and less perceived risk of contamination. At these stations, users can rapidly fill up their personal bottles, and then the water will automatically shut off to prevent waste. Bottle fillers can be installed as standalone stations, as attachments to existing fountains, or as models that come with a drinking fountain. 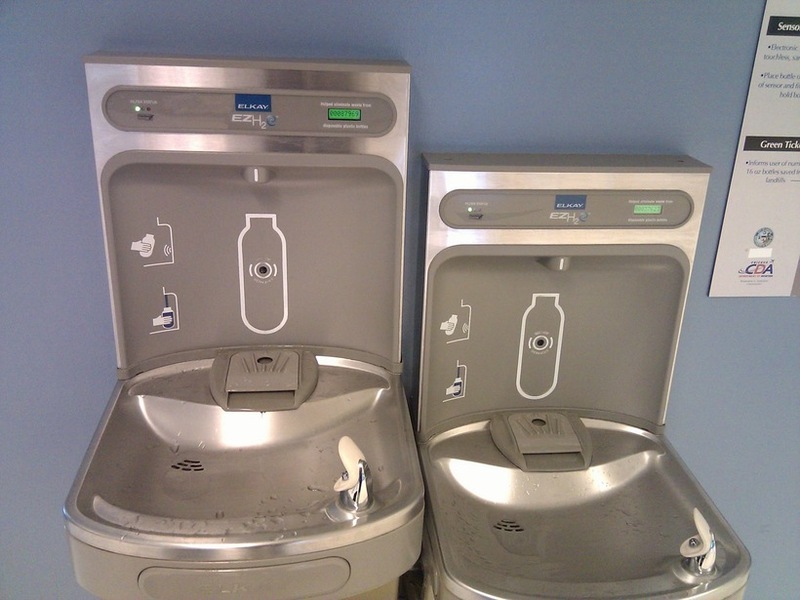 Many of these bottle filling stations include a digital display showing the number of disposable plastic bottles saved from landfills. The cost of a bottle filling station can range from as low as $500 per unit for a retrofit kit (an attachment) to over $1,700 for a standalone freestanding model. PHOTO: PETER GLEICK — New water bottle filling stations offer high-tech options for travelers. Water chilling is another feature that makes modern fountains attractive to users. Chilling is typically available for indoor units where they can be connected to an electrical supply. Some fountains have built-in chillers, but existing non-refrigerated fountains can also be retrofitted with remote chillers. Alternatively, ice-chilled models or drinking fountains equipped with solar power systems can be used in areas that lack access to a power supply. Most fountains can dispense up to 6.6 gallons of chilled water per hour, but in high-traffic areas, a fountain should be able to dispense at least eight gallons of chilled water per hour. Some cities in Europe and Australia have taken the idea of chilled water further and added carbonation capability to regular drinking fountains. The concept of sparkling water fountains originated in Italy and has spread to other regions, including Lens and Brussels in Belgium and Perth in Australia. In Paris, these fountains are known as “La Petillante” or “she who sparkles.” The chilled and carbonated quality of this tap water makes it more attractive to locals and visitors alike. Some La Petillante fountains have vending machines nearby to sell reusable water bottles. Eau de Paris, the public company responsible for providing and maintaining drinking fountains throughout the city, offers a very interesting map of all of its 725 drinking fountains. There are currently six sparkling water fountains on the map. Users can also access a report (periodically updated) of each fountain’s quality, including temperature, pH, chlorine, and nitrate levels. With the Flint water crisis raising awareness of potential lead contamination in tap water, the installation of filters can reduce risks in contaminated fountains until aging pipes, lead solders, and other sources of contamination can be effectively removed. There are many different types of filters, the most common being activated carbon, which may be integrated with other filter media to increase filtration efficacy. The cost of carbon filters ranges from $90 to $160 per unit, depending on filtration capacity and effectiveness, and filters must be replaced according to the manufacturer’s maintenance schedule, typically once or more each year depending on use. In addition to carbon filters, reverse osmosis (RO) is an advanced filtration process that is also used by desalination plants. The process involves pre-screening the water to remove particles that can damage the RO membrane and then forcing water through a semi-permeable membrane under high pressure to filter out salts and other impurities. The finished water is then treated to increase the pH level and reduce the corrosiveness of the water. Replacement of RO membranes may be done every two to four years, but pre- and post-filters may need replacement every six to 12 months. Reverse osmosis is an energy-intensive and costly process that uses approximately three gallons of waterfor every gallon of filtered water produced. It is appropriate for removing contaminants that cannot be effectively removed by carbon filters, such as arsenic, hexavalent chromium, nitrate, and perchlorate. Other methods for removing contaminants include ceramic filters, distillers, and UV light units used to disinfect water. Since filters add to the cost of water fountains, water quality tests should be done before making any filter investments to both ensure that filters are needed and to identify the most appropriate type of filter to install. Drinking fountains must comply with the NSF/ANSI 61 Standard, which regulates the levels of contaminants, including lead, that can leach from the fountain unit into the water. Most publicly accessible spaces that provide drinking fountains are also required to meet standards specified by the American with Disabilities Act (ADA). These standards pertain to fountain installation, location, and other specifications (e.g., water pressure) that aim to provide the greatest access to the disabled. More effort is needed to improve access to affordable and safe drinking water at the national, state, and local levels. While we push for the broad upgrade of water infrastructure, we must also engage with cities, park districts, schools, and other institutions to rebuild public confidence in drinking fountains. As we move toward better public drinking water access, whether installing new fountains or replacing old ones, we should strive to use the most appropriate fountain designs in order to effectively provide high quality and affordable tap water to all who need it.